Martial arts seminars have unique characteristics that differentiate them from standard ongoing classes in a school or club atmosphere. They are usually not your own students who will benefit from building on the knowledge base you offer over time. They may not even be from the same style as you, or even the same martial art. As such, I take a different approach to teaching them so that students make the most of the experience. When preparing a lesson plan for a seminar, I try to find out as much as possible about the students I’ll be teaching, what their style is like, what their experience is with the seminar topic, how many students there will be, how much training experience the students have, what the space where the seminar will be held is like, etc. I then write my lesson plan to address the unique needs and circumstances of the seminar in particular. If the students are less familiar with the topic, I’ll spend extra time covering foundational concepts. If there is cross-over with their style of martial art, I’ll draw on their experience where it make sense to do so. If there will be a lot of students in a limited space, I’ll create groups of a sensible size and allot more time for each technique so that students can train safely. I’ll even ask instructors if there are any particular situations they want to cover as part of the seminar. In some of the recent ground defense seminars I’ve taught related to my book When the Fight Goes to the Ground, I’ve asked if there were any positions that their students struggled with more so than others. Of course, I still have my own ideas as to what I intend to teach, but I can often incorporate some requests as well. Because I am usually not going to have the opportunity to continue to build on the skills I teach at one-time seminars, I focus more on concepts than I do on teaching particular techniques. Don’t get me wrong. I don’t just stand there and lecture for hours either. I do teach techniques, but as part of a over-arching conceptual master plan. With my ground defense seminars, I don’t care so much if students learn to apply the techniques exactly as I show them, unless there is a good reason to do so. I am more concerned with them taking home the base principles so they can continue to develop on that base at their own dojos. With my ground defense seminars, I’ve been focused on making sure students learn to apply a combination of both body shifting techniques and attacks to vital targets to get off the ground as quickly and efficiently as possible. 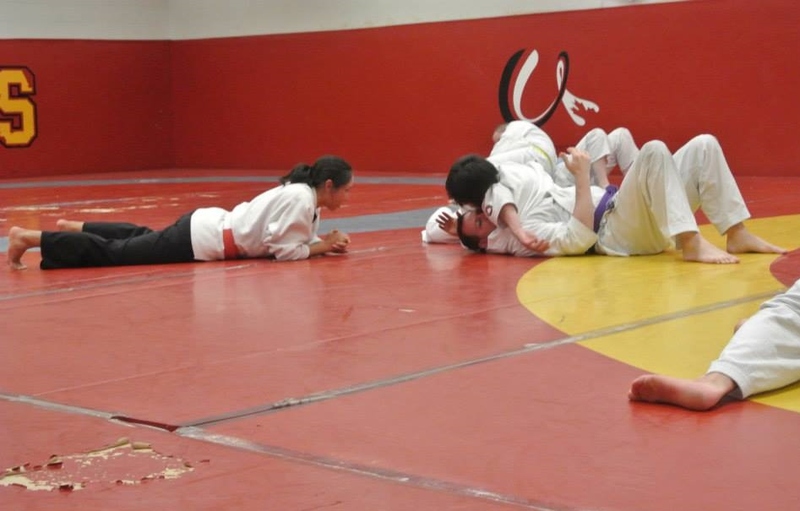 When it comes to defending against joint lock submission, I focus on trying to keep limbs closer to the body so they can more effectively block or counter them. While I do teach specific techniques, I always come back to the underlying concepts that make them work, so they can more easily improvise other defenses against similar but different attacks. In addition to teaching concepts, I always try to introduce different ways of developing the skills presented so they have something to take home and can continue their development with after the seminar is over. I did this in my recent ground defense seminars in a variety of ways. I taught a favourite warm-up game, Pitbulls vs. Poodles, that serves as a great ice-breaker while simultaneously warming up the body in a way that also works with ground defense skills. The game starts with everyone on their hands and knees and one or more people being “pitbulls” who go around trying to flip the “poodles” onto their backs, transforming them into pitbulls. I also taught different live training exercises to pairs of students in which one person took on the attacker role and one the defender role so they could work on specific skills in a more adaptive, unpredictable context, rather than just working techniques in a compliant manner. These are just a couple of examples, but whatever exercises I choose, they always keep objectives of the seminar in mind. I find it very rewarding to teach martial arts seminars outside of my own dojo. Not only to I get to have fun meeting people from other areas and other styles, I often gain insights from the different contexts that I might not have otherwise gained at my own dojo based on the different types of student needs and backgrounds. If you’re interested in having us run a seminar for your school or organization, you can find out more info on our martial arts/self-defense seminar page.